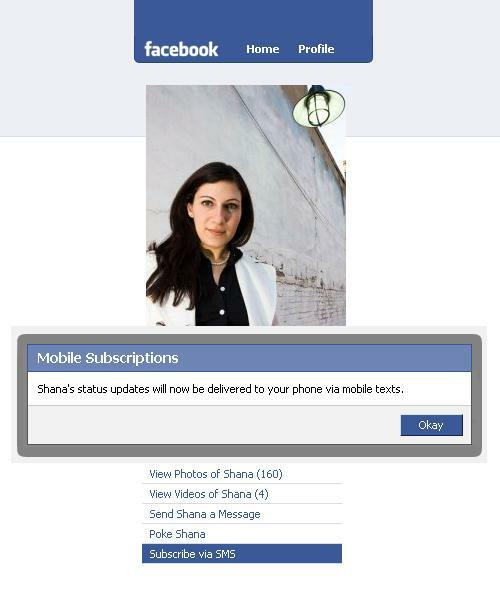 What is “subscribe via SMS” on Facebook? How can I “subscribe via SMS”? How do I add “subscribe via SMS” to my Facebook account? Why can’t don’t I see “subscribe via SMS” on a friend’s Facebook account? Can I change my settings so that Facebook friends can’t “subscribe via SMS” to my updates? Can someone tell whether I’ve “subscribed via SMS” to someone’s updates? Can I tell who has “subscribed via SMS” to my status updates? When I reply to a status by text, why does it go to that person’s inbox? Is there a way to change it? What is the cost of subscribing to receive a Facebook friend’s statuses by SMS? Is there a way to subscribe to all my friends’ status updates? I have other questions about “subscribe via SMS” that you haven’t answered. Where can I learn more? “Subscribe via SMS” is the ability to recieve a friend’s status notifications on your mobile phone through text messages. Go to the profile page of the person whose status updates you’d like to receive by text message on your mobile phone. Under their profile picture, you will see a list of options. “Subscribe via SMS” should be one of the options. Click on “subscribe via SMS”. It’s that easy! From what I can tell there is no way to add the “subscribe via SMS” to one’s profile. This option is “turned on” by Facebook and should simply appear. Note that you will not see this option if you’re looking at your own profile. I would recommend asking a friend to log-in and go to your profile in order to see if the “Subscribe via SMS” option is present. Sorry to be the bearer of bad news, but mostly your friend has restricted your access (or perhaps everyone’s access) to their status updates. At this point, anyone who is able to see your status updates can choose to subscribe to them. To change who sees your Facebook status updates, go to Facebook’s Profile Privacy page and change the “Status and Links” settings accordingly. Currently, there is no way for someone to check whether you have subscribed to their status messages. Currently, there is no way for you to see who has subscribed to your status messages. When I reply to a status by SMS, why does it go to that person’s inbox? Is there a way to change it? Yes, the current functionality of replying by SMS means that the person will get your reply in their Facebook inbox. There is no way to change this setting at the present time. At this time, I do not believe that there is a way to subscribe to all your friends at once — and with good reason. I would expect that this could be dangerous depending on the number of Facebook connections one has. Simply leave your question in the form of a comment below and I will do my best to help you.